Blaze of Ra from Push Gaming brings players on an adventure through Ancient Egypt to explore the secrets of the pyramids and the mythological gods. The game features 40 paylines and a generous top prize of 50x your stake. You can also trigger free spins with just one scatter symbol – during which expanded wilds are added to the reels. Read our full review below. Make your way across the barren dessert to explore the ancient ruins of the Egyptian Gods. You’ll encounter amazing treasures, as the game offers up a top prize of 50x your stake, and you can claim some amazing bonuses thanks to the free spins round that features expanded wilds. Blaze of Ra from Push Gaming features vibrant graphics that depict Ancient Egyptian culture in a new way. Players are sure to be impressed with the look of the game, as it is overall very sharp and modern. The game is set against a backdrop of pyramids with a strong breeze blowing sand across the screen. There’s also an atmospheric theme playing that really sets the mood. In Push Gaming’s Blaze of Ra, there are 40 paylines, which means that you have plenty of ways to win as you spin the reels. Bet sizes are fixed from just 20p to £100, so it doesn’t matter whether you’re a high roller or a casual player – you’ll still have the same great gaming experience that suits your budget. What Is the RTP of Blaze of Ra Slots? Blaze of Ra features an RTP (return to player) or 96.4%. This payout percentage refers to the amount of money that the game pays out for every £100 that the player wagers. It is also a medium-volatility slot that offers up fairly frequent prizes. You can expect your payouts to be less generous than in a high volatility game but more generous than a low volatility slot. You have to land three or more matching symbols to hit a win while playing Push Gaming’s Blaze of Ra online slot. The top prize available is worth 50x your total wager, which makes for some very generous payouts. There is a Nudging Wilds symbol that is available during the base game. When one or more Ra symbols appears in the top two symbol positions, they will nudge down before the next spin begins. This helps to trigger winning combinations more easily. There is also a free spins round that can be triggered by scatter symbols. In most online slots, you have to land a minimum of 3 scatters, but you only need one when playing Blaze of Ra. Each scatter has a number (1 or 2), and that is the number of free spins you will be rewarded. During this round, the Ra symbol is expanded on the 1st, 3 rd and 5th reels. With stacked wilds available on the majority of reels, this slot offers up some hugely generous winning potential. You can also retrigger this bonus by landing just one more scatter in the free spins round. 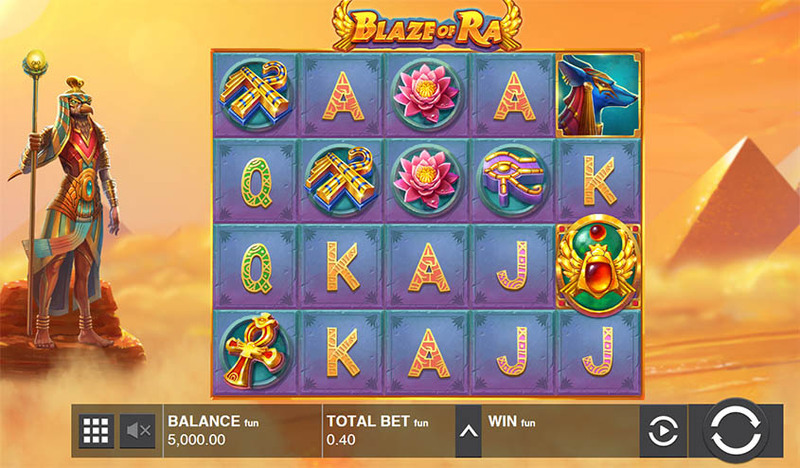 Like all Push Gaming slots, Blaze of Ra is available to play on both tablets, smartphones and personal computers. The game is optimized to look great on any screen size, and you can give this game a spin directly from your web browser. Blaze of Ra may be an Ancient Egyptian online slot – but it’s not like every other game out there. The generous bonus features and unique art style really set this game apart. Can I Play Blaze of Ra Slots For Free? Blaze of Ra from Push Gaming is a slots can that you can play for free right here at Slots Temple. We have over 2000 of the best slots on the web, and there is no need to sign up or deposit any cash. Does Blaze of Ra Slot Have Free Spins? You can trigger the free spins round in Blaze of Ra by landing just one scatter symbol. During this round, three reels will display stacked wilds the entire time. Can I Win Real Money While Playing Blaze of Ra Slots? To win real money while playing Blaze of Ra slots online, you just have to sign up to a Push Gaming-powered online casino and make a deposit. Can I Play Blaze of Ra Slots with No Deposit? While Blaze of Ra is not available as a no deposit slot at real money casinos, you can play it at Slots Temple completely for free. There is no need for you to deposit any cash to give this game a spin. Can I Download Blaze of Ra Slots? As a browser-based game, Blaze of Ra is an online slot that does not require you to download any software. * Blaze of Ra trademark / license is owned by Push Gaming. This site is not endorsed by Push Gaming.